We created the robots to make our lives easier, to gather and process the abundance of information our society was producing and find more efficient ways of organising our cities, our businesses and our financial affairs. The robots’ computing brains could do this more naturally than we humans ever could. Our businesses and government institutions began to subject the human beings who worked for them to robotic control. We believed the assurances of those in power when they told us the robots had the best interests of humanity at the core of their programming. However, the societies they have created seem to have little resemblance to the ones we envisaged. The robots took control of producing the items we needed to survive, turning food and shelter into commodities to be built into abundance, rather than things shared in relationship with those around us. They turned our landscapes into factories, digging out the resources they needed, allowing their waste to pile up and their emissions to pollute the air. They created better systems for moving money from place to place so as to increase the numbers in their spreadsheets, ignoring the lives that were impacted by the flow. They built systems to organise people more efficiently, replacing names with numbers in order to better identify and track each individual. Seeing people as packages of data allowed them to better control the flow of goods and services to them, but it also meant that irregular flows of data were a danger to the system and had to be eliminated – even if that data represented people fleeing their homes in fear of their lives. Human relationships were replaced with reporting processes. Love between couples was reduced to matters of procreation and pleasure. Outer beauty was easier to quantify than inner beauty, and much easier to create products to enhance, and so became the standard by which people in society were judged. The robots had no frame of reference for concepts like the soul, so religion was turned into a set of protocols to be followed without thought. Our schools were seen as inefficient models for producing productive citizens, so were reprogrammed in order to better fulfil the needs of the system. Subjects more likely to lead people into productive roles were given prominence, while subjects such as music and art were set aside as unimportant to the system as a whole. People from the corporate sector were brought in to run the schools, to ensure they ran according to the same efficiencies as the other systems the robots had created. Before we knew what was happening the robots had transformed our world. It was the worst kind of coup – the sort that is over before we knew a battle had even been waged. Each day people go about their business, feeling unhappy but unable to name the source of that dissatisfaction. Most have joined the ranks of the robots, believing that the key to happiness rests in finding a comfortable place within their system. They rail among themselves at every small incursion against their humanity. But their rage is impotent. Those in power say that the problems like crime, pollution, wealth inequality and social disadvantage that continue to plague our world are the result of human beings not properly integrating into the system. If we can get rid of our humanness, the system will work perfectly, the robots’ masters say. People strive to be more like the machines that guide us, but the problems that plague our societies only get worse. A small, but growing, number of people are starting to resist the tyranny of the robots. They have realised that the robots cannot deliver on their promises of a better world. The solutions to humanity’s problems can’t be written into a set of rules and protocols to be followed, or a set of numerical targets to be achieved. The Resistance believes in solutions based in concepts such as faith, love, charity, and self-sacrifice – concepts that draw on the inner human life that is beyond the robots’ ability to understand. 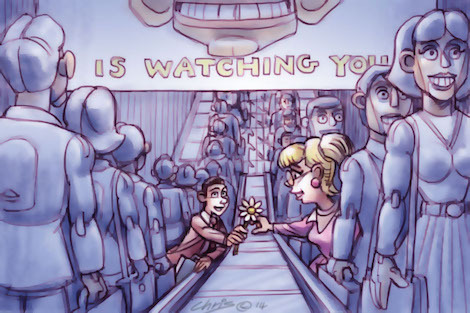 You'll know the Resistance because they'll be the ones who give you a smile and offer you their seat on the train. They'll be the ones wanting to have a chat while serving you at a fast food outlet. They'll wear secondhand clothes rather than the latest fashions. They'll talk about rehabilitation for offenders, rather than wanting to see them rot in prison. They'll laugh and shrug when they get caught in a rainstorm or when their train gets cancelled or when they get stuck in a traffic jam. They'll be holding signs at rallies for refugees, and against higher university fees. They'll give themselves away, in hundreds of different ways each day, through small kindnesses and gestures that have no place in the robots' world. The resistance believes that in time, human beings will reclaim their place in our societies. The robots have their uses in keeping our societies running. But we will come to understand that they can never be allowed to become our masters. Michael McVeigh is the editor of Australian Catholics magazine, and senior editor at Jesuit Communications Australia. The revolution is only beginning. Thanks Michael. What a wonderful read to start the day - keep the insights coming Michael! Truly Michael McVeigh sir this is science fiction genre from 1960s:[eg Android Doppelgängers;the Blob; The Human Duplicators. And in 21st millenium:Megamind; and Cowboys and Aliens. I simply refuse to return to pre technology days frankly just for more human control! Viva ATMs, PCs, automatic vacuum cleaners. And thank you my Patrician Brothers tennis coach in 1957 who introduced an auto tennis practice, ball-machine with erratic wooden arm,that without blinking could ace hyper angst students from all angles! To be part of the resistance is not without cost. My friend stood quietly on a country street in support of refugees. For this she received a letter delivered to her home riling against refugees and concluding with the threat " watch out, we know where you live". And this was just two days ago. Anne Chang. Thanks for this timely reminder. I,ll try to pass on a smile and a welcome. These things start with one! Maybe there is a way to inform the creators of the robot mentality after all!!! Thanks Michael. I loved your story and sadly it is all too true. In my job I actually talk to real people and I love doing it. My pet hate is the machines at the end of 1800 numbers! Perhaps the trickiest relationship to show on-screen is the one between siblings, and it’s not just about finding actors who look alike. What The Skeleton Twins tries to tell audiences about damaged people is solid but uninspired: don’t deny your heart, you have to deal with your past rather than bury it… But it’s the chemistry between the two that makes this something special. A Bone of Fact is one part love letter and two parts plea bargain. That’s how Walsh can take a stab at Catholicism one minute and the next admit that in the 'thrall' of Michelangelo’s Pieta he loses all faculties. And for someone who’s gleamed much from betting, gambling gets short shrift.